Follow @drewsilv and @Rotoworld_BB on Twitter. The Athletics look to be in full control of a spot in the American League Wild Card Game and they still have a chance of catching the Astros at the top of the American League West standings. But the team’s patchwork starting rotation took another big hit on Tuesday. 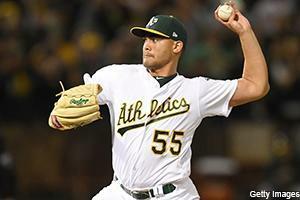 Sean Manaea, who landed on the disabled list two weeks ago with what was originally described as left rotator cuff tendinitis, is now scheduled to undergo major shoulder surgery next week that will definitely sideline him for the remainder of the 2018 season and could keep him on the shelf through all of 2019. As noted by Slusser, the Athletics have lost 10 different starters to injuries this season and five to season-ending surgeries. And yet they’re somehow 31 games above .500 here on September 12 and trail the Yankees by just two games for the top American League Wild Card spot. They’re also 8 1/2 games up on the Mariners for the second American League Wild Card and only three games behind the defending World Series-champion Astros for first place in the American League West. Oakland ranked No. 4 for the fourth straight week in our latest Rotoworld MLB Power Rankings. Manaea carried a lot of fantasy hype into the 2017 season after posting a 3.86 ERA, 1.189 WHIP, and 124/37 K/BB ratio over 144 2/3 innings in 2016 at age 24. That proved to be a letdown, but the 26-year-old southpaw bounced back for a 3.59 ERA and 1.077 WHIP over 27 starts (160 2/3 innings) in 2018. He threw a no-hitter against the American League East-leading Red Sox back on April 21. Mike Fiers would presumably start the American League Wild Card Game for the Athletics if that’s where they end up. He’s been a tremendous addition, boasting a 5-0 record, 2.72 ERA, 0.93 WHIP, and 42/7 K/BB ratio in 39 2/3 innings (seven starts) since Oakland acquired him from the Tigers in a waiver trade on August 6. The A’s are undefeated on days he pitches. Josh Donaldson had a rather underwhelming Indians debut on Tuesday night against the Rays, going 0-for-4 with a strikeout before getting replaced at third base by Erik Gonzalez entering the bottom of the eighth inning. Donaldson did give a pitch a ride to deep center field in his first plate appearance, but it fell about 14 feet shy of the wall for a flyout. He then lined out to right field in his second plate appearance, was called out on strikes in his third plate appearance, and grounded into a force out in his fourth and final plate appearance. The former MVP batted fifth for Cleveland, behind Francisco Lindor, Michael Brantley, Jose Ramirez, and Edwin Encarnacion. That should be a very fruitful spot for counting stats moving forward. Donaldson is 32 years old and hadn’t appeared in a major league game since May 28 because of a lingering left calf injury, so he’s probably going to get regular days off ahead of the postseason. But when he’s in there, he should be active and started in all relevant fantasy leagues. Between the 2015-2017 seasons with the Blue Jays, who traded him to the Indians via waivers on August 31, Donaldson averaged a .946 OPS (151 OPS+) with 37 home runs and 100 RBI per year. He hit a grand slam in his one minor league rehab game with the Indians’ Triple-A affiliate. Rockies shortstop Trevor Story entered play Tuesday batting .293/.348/.559 with 32 home runs, 39 doubles, 99 RBI, and 25 stolen bases in 142 games this season. He hit an RBI double off Diamondbacks right-hander Zack Greinke in the bottom of the first inning, giving him 40 doubles and 100 RBI, and making him the first shortstop in major league history to tally 40-plus doubles, 30-plus homers, and 25-plus steals in a single season. What’s more, Story is now just the second shortstop in major league history with 30-plus home runs, 100-plus RBI, and 25-plus steals in a single campaign. The other: Alex Rodriguez, who accomplished the feat in 1998 with the Mariners. Story still has another 17 games to pad his stat line. Nolan Arenado gets most of the love when people talk about MVP candidacy in Colorado, but don’t overlook this second-half surge by the 25-year-old Story. He’s going to get some votes. In terms of fantasy output, Story currently ranks as the No. 3 overall shortstop, behind only Francisco Lindor of the AL Central-leading Indians and Alex Bregman of the AL West-leading Astros. The Rockies lost Tuesday’s game to Arizona but currently sit in first place in the NL West. National League Quick Hits: Mets manager Mickey Callaway confirmed Tuesday that Jacob deGrom will make only three more starts this season … Juan Soto hit two home runs -- including a go-ahead shot in the 10th inning -- as the Nationals swept Tuesday's doubleheader versus the Phillies … Mike Foltynewicz tossed his second complete game of the season Tuesday in the Braves’ victory over the Giants … Kyle Schwarber (back) remained out of the Cubs' starting lineup on Tuesday night against the Brewers … Luis Castillo fanned nine batters over 6 1/3 innings of one-run ball in the Reds’ victory over the Dodgers on Tuesday … Miles Mikolas struck out seven and held the Pirates to one run over seven innings Tuesday in his 15th win of the season … Marlins manager Don Mattingly said it's possible Dan Straily (oblique) won't pitch again this season … Brandon Morrow (elbow) is scheduled to throw another bullpen session on Wednesday … Jose Quintana pitched three-hit ball for 6 2/3 innings as the Cubs blanked the Brewers on Tuesday … Johan Camargo departed Tuesday night's game against the Giants due to left groin tightness … Brandon Belt was held out of the Giants' starting lineup on Tuesday due to ongoing right knee soreness … Maikel Franco was diagnosed with a shoulder contusion and neck tightness after flipping into the third base camera well in the eighth inning of Tuesday’s game against the Nationals … Yoshihisa Hirano struck out a pair of batters in a scoreless ninth inning Tuesday to record his first career major-league save in the Diamondbacks' win over the Rockies … Jedd Gyorko (groin) is on track to be activated from the disabled list Thursday … Raisel Iglesias nailed down his 26th save of the season with a scoreless inning Tuesday versus the Dodgers … Joe Ross is tentatively scheduled to start Thursday against the Cubs … Corey Seager is now walking without crutches following arthroscopic surgery on his left hip last month … Adam Wainwright is scheduled to start Sunday night against the Dodgers … Mike Montgomery is lined up to start for the Cubs in Thursday's makeup game against the Nationals … Ryder Jones will also undergo a cleanup of tendinitis in his left knee on Wednesday, along with surgery to repair a dislocated kneecap. American League Quick Hits: Yankees manager Aaron Boone said Aroldis Chapman (knee) has been running on a treadmill and "looks good" … Corey Kluber will be skipped from his scheduled start this weekend against the Tigers … Aaron Judge (wrist) will take batting practice again on Wednesday … Chris Sale (shoulder) worked a scoreless inning as the “opener” for the Red Sox on Tuesday night against the Blue Jays … Miguel Sano (knee) was held out of the Twins' starting lineup again on Tuesday … Jean Segura was not in the Mariners' starting lineup on Tuesday due to a virus … Lance McCullers (forearm) threw a successful 40-pitch bullpen session on Tuesday … Shane Bieber fanned 11 batters over 6 2/3 innings as the Indians shut out the Rays 2-0 on Tuesday … Blue Jays manager John Gibbons acknowledged Tuesday that Marcus Stroman (blister) likely won't pitch again this year … Joe Mauer went 2-for-4 with a grand slam and a walk in the Twins' win over the Yankees on Tuesday … Matt Davidson was held out of the White Sox lineup on Tuesday due to general soreness … Brad Peacock has been diagnosed with hand, foot, and mouth disease … Rays manager Kevin Cash said Tuesday that Kevin Kiermaier is dealing with a "general illness” … Alex Cobb left his start Tuesday against the A’s due to a lingering blister on his right index finger … Whit Merrifield went 2-for-4 with two steals and two runs scored Tuesday against the White Sox … An MRI turned up negative on Matt Duffy's back and he is listed as day-to-day … Tigers manager Ron Gardenhire said Tuesday that Spencer Turnbull will get a start or two down the stretch … Brett Anderson (forearm) felt good a day after throwing three 15-pitch innings in a simulated game and could return to the A’s rotation Thursday … Roberto Osuna spun a perfect ninth inning to notch a save Tuesday in Detroit … Felix Hernandez (hamstring) said Tuesday that his right hamstring is feeling "okay” … Nick Tropeano (shoulder) is officially done for the season … Matt Barnes (hip) threw on flat ground Tuesday …Rays pitching prospect Jose Mujica underwent Tommy John reconstructive elbow surgery on Tuesday … Hisashi Iwakuma is headed back to Japan to try to continue his playing career … Blue Jays placed catcher Russell Martin on the paternity leave list … Tigers designated right-hander Johnny Barbato for assignment.